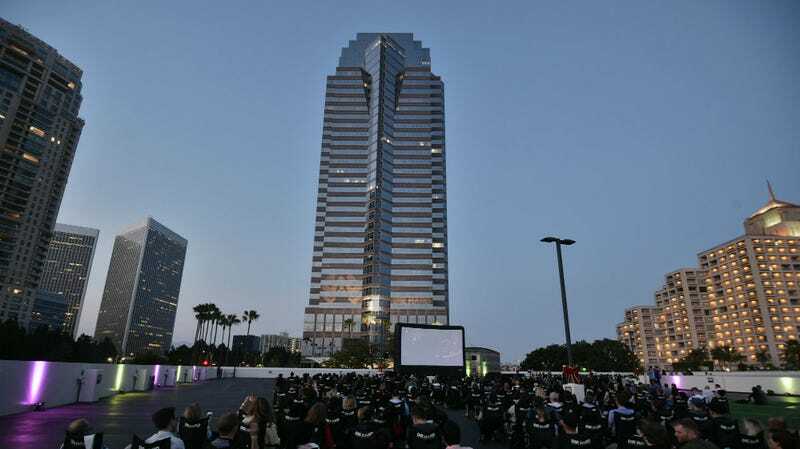 A screening of Die Hard outside Fox Plaza, aka, Nakatomi Plaza, the building where the film was set and filmed. Of all the filming locations scattered around Los Angeles, one towers above them all. Literally. It’s Fox Plaza in Century City, better known by its fictional name “Nakatomi Plaza,” the setting of John McTiernan’s 1988 classic Die Hard. The building can be viewed from all across Los Angeles and has changed surprisingly little in the 30 years since the film was released. How little has it changed? Well, to promote the 30th anniversary Blu-ray release of the film, Fox invited members of the press to take a Die Hard specific tour of the building. And it. Was. Awesome. Like, seriously. For someone who loves Die Hard, getting to explore the nooks and crannies of the building was one of the coolest things I’ve ever done in this job (and that includes being paid to build a Lego Millennium Falcon). We learned that the lobby of the building has remained almost exactly the same since 1988. The elevators are almost exactly the same too. A few canopies have been added to the exterior on both sides but, besides that, almost everything on the outside looks just like it does in the movie. That is, except a missing 5th railing. In the film, an LAPD tank breaks a railing going up the staircase and the building has never replaced it, so there are still to this day only four railings. Four railings outside the building because the middle one was destroyed during filming. The other side of the building. The canopy is new but the rest is not. And look, Al’s cop car and John’s limo are out front. 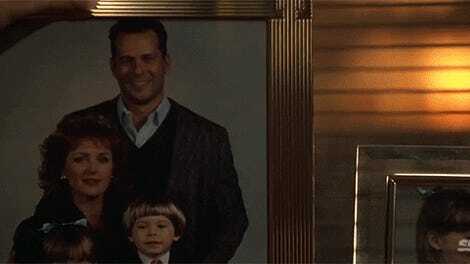 There are lots of elevator scenes in Die Hard and you’ll recognize that pattern in them. The lobby is almost exactly the same. A huge percentage of Die Hard that’s inside the bowels of the building, but not at a party, was actually shot in the building. (Which makes sense as it’s next door to the 20th Century Fox studio lot, the company that paid for and distributed the film). Anytime someone is running down a hallway, going down a flight of stairs, in an elevator, walking by some big, industrial pipes, all of that stuff is still there. Some of them are rather subtle. Others are not, such as the stairs McClane runs up to the roof (which are actually in the basement) as well as the chain next to them that he uses to hang Karl, the blonde-haired, bad guy. You’ll recognize these stairs as the ones McClane runs up to the roof several times in the movie. In the middle of this staircase is the chain he uses to hang Karl. The iPad was set up to illustrate the scene. Here’s the walkway and panel that Karl cuts the phone lines on. The super steep staircase on of the thieves slides down very quickly. The area where McClane meets Hans Gruber and Gruber pretends to be an American is still exactly as it was in the movie, and the tour guides even set up a few little trinkets to remind us. Those scenes, while not obvious in the movie, are actually on the roof of the building. The production did add a few obstacles and things to make it a bit more dynamic visually but it’s still instantly recognizable. The roof of Nakatomi Plaza, minus explosives. If we needed to take a jump, fire hose was provided. Here’s where McClane meets Hans Gruber and Hans asks for a smoke. Downstairs the loading dock where the bad guys load in, which is the same place the limo crashes into their getaway car, is also intact, down to the signs on the wall. Those signs have remained the same since filming, and the loading dock is massive. 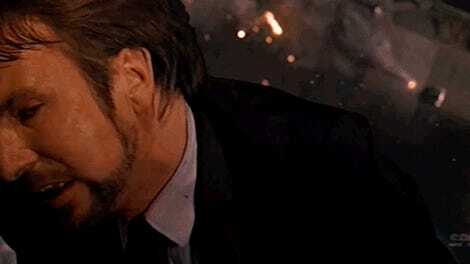 Unfortunately, the building, which is currently a functioning office building, doesn’t offer Die Hard specific tours. But it really should. Walking around this building, you get an appreciation not just for the impressive location shooting the film did, but how the film, and the building, have endured for all these years. A model of the building from the film still resides inside the building, along with an appropriate quote. Once the tour was over, we were then treated to something maybe even more special. A screening of Die Hard from the parking lot of the building. And, as you may expect, the film still holds up as one of the coolest action movies of all time. For a reminder of the wonder that is Die Hard, check out the 30th anniversary Blu-ray and 4K.